TM3-Primus is a compact and innovative addition to RTW’s TouchMonitor range of audio meters. It provides a full set of easy-to-read instruments for level and loudness metering in commercial and non-commercial production and broadcasting environments. Targeted to music and multimedia producers, the TM3-Primus is a full-featured device with a minimum footprint and a 4.3″ touch-sensitive display for standalone operation. It includes analogue and digital audio interfaces doing away with the need for the interface box required for the other TM3 series units. 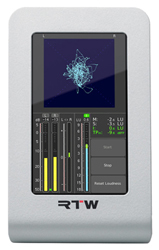 In addition, it includes an advanced USB hybrid mode where a metering point in a digital audio workstation (DAW) (implemented using a specific RTW plug-in) is seen on the TouchMonitor’s screen. Also, a USB port allows for implementing a new USB/plug-in hybrid mode that enables metering to be performed on the DAW so that a user can see and process the information instantly. With a budget-friendly price, the TM3-Primus is an advanced addition to the TouchMonitor range that is ideal for a variety of entry-level applications across multiple markets. The TM3-Primus is equipped with everything needed for loudness and audio metering. As an ultra-compact and low-cost TouchMonitor version, it is equally suited for professional use in minor or secondary workflows for broadcasting, video editing plus music and voice recording. It includes a new quality solution for non-commercial use in small radio environments or podcasting. Like other models from the award-winning TouchMonitor series, the TM3-Primus comes with a highly intuitive and user-friendly touchscreen interface that simplifies system handling even for operators without background knowledge.